Beautifully cast quality pendants & medallions ready to add to any necklace. Simply add a bail and attach to the necklace of your choice. 64mm x 42mm Elegantly detailed substantial filigree cross in a classic antique silver finish. 12 pieces per pack. Approximately 4mm depth with a 2mm ring. Cross Pendant w/hidden bail for attaching to your necklace design. 51mm x 35mm x 4mm Crown Shield Medallion Pendant. 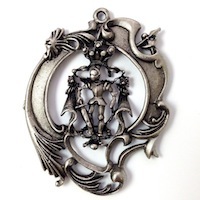 Beautifully detailed cast pewter pendant ready to put on the necklace of your choice. Just add a bail. Made in USA. 58mm x 56mm x 3mm Baroque Medallion / Antique Roman Coin Pendant, each. Beautifully detailed large cast pewter pendant ready to put on the necklace of your choice. Just add a bail. Made in USA. 65mm x 59mm x 5mm Baroque Knights Helmet Medallion Pendant with armored knight. Beautifully detailed large cast pewter pendant ready to put on the necklace of your choice. Just add a bail. Made in USA. 65mm x 45mm x 7mm Baroque Shield Medallion with a Knights Helmet. Beautifully detailed large cast pewter pendant ready to put on the necklace of your choice. Just add a bail. 7 bezels for 3mm crystals if you want to add a bit more royal "treasure" to it. Made in USA. 73mm x 56mm x 5mm Baroque Rococo Medallion with armored knight. Beautifully detailed large cast pewter pendant ready to put on the necklace of your choice. Just add a bail. Made in USA. 74mm x 33mm x 2mm Baroque Rococo Filigree Key Pendant Charm, 2 each. Beautifully detailed large cast pewter pendant ready to put on the necklace of your choice. Just add a bail. Made in USA. 83mm x 61mm x 6mm beautiful weight Baroque or Victorian pendant with deep bezel. Made in USA of cast pewter with vintage Ant Gold plating. 40mm x38mm inner bezel size.